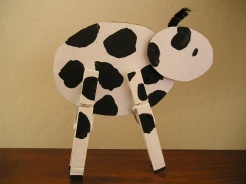 This Clothes Pin Calf is a great Cow Craft for Preschoolers. The Calf's spots look great when they're made with black thumb prints! 1. Paint your clothes pins white. From your cardboard or cardstock or paper plates, cut two ovals, one big, one small. Glue the smaller one onto the larger one to make your calf's body. 2. Paint black spots all over your calf, a thumb print would work really well, or a paint brush will do. 3. Once the paint is dry, 'pin' the calf's legs on. If you have a small piece of black pipe cleaner or black paper, you can make a horn by gluing it on the back of the calf's head.